BJP has lost its big majorities in the three states it was ruling in the Hindi heartland, while it made no dent in the other two. The final results have not yet been declared but counting is fairly advanced and one thing is clear: BJP has suffered a major setback in all the three states it was ruling – Rajasthan, Madhya Pradesh and Chhattisgarh. In Telangana, its vote has declined and its seats have gone down from five to three. In Mizoram, it was a marginal force with no seat in the outgoing Assembly. This time it has scraped through with a single seat. In Rajasthan, the Bharatiya Janata Party (BJP) has suffered a loss of nearly 7% in its vote share compared with the last Assembly elections in 2013. In MP, the loss is about 3.5%, in Chhattisgarh the loss is a whopping 8.5%. 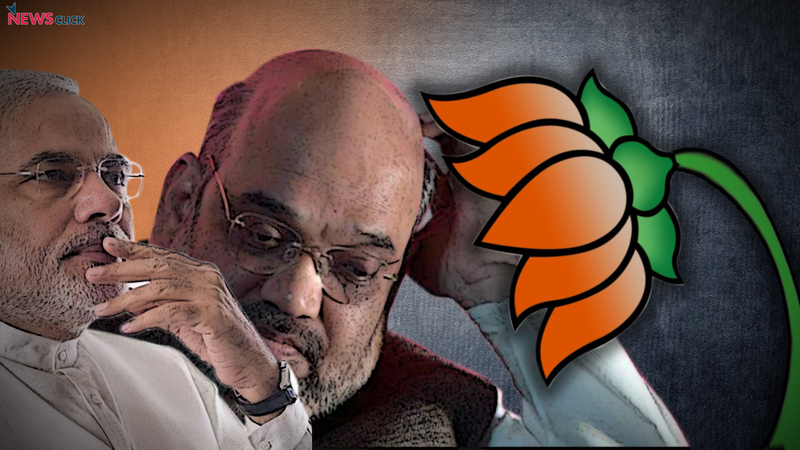 Compared with the 2014 Lok Sabha elections when it swept these three states on the back of the so-called Modi wave, BJP has suffered an even more ignominious loss, as can be seen in the election data tool available on the Newsclick site. In Chhattisgarh and Rajasthan, its vote share has gone down by about 17% while in MP it has declined by about 13%. In terms of seats – and government formation – the waters are muddied up in MP because of the close race with the Congress leading in 115 seats and BJP in 104 at the time of writing. Since the halfway mark is 115 in the 230-member House, it looks like the MP Assembly is going to be hung – at least 116 would be required for majority. Four Bahujan Samaj Party (BSP) MLAs and six independent or small party winners will come into play and become crucial. BSP, which has been consistently opposing BJP in recent years, should support the Congress but the allegiance of independent/small party MLAs is anybody’s guess. In Rajasthan, Congress with 103 leads, appears to have crossed the halfway mark of 99 (elections were held for 199 of the200 seats). The state has seen at least 18 independent or small party candidates winning of which at least six are BJP rebels and seven are Congress rebels. In Chhattisgarh, Congress has comfortably romped home with 63 leads in the 90-member House with 46 as the halfway mark. So, both in terms of vote share and seats, BJP emerges as the uniform loser in these three states. The reasons for this stunning defeat are not too difficult to find. As Newsclick had repeatedly pointed out in the past months, there was a groundswell of discontentment building in these three big states primarily because of farmers’ destitution, raging joblessness (especially among youth), stagnant wages even as prices were rising, and the twin disasters of demonetisation and Goods and Services Tax. In other words, there was a rejection of the economic hardship imposed by the unabashed neo-liberal model imposed under the BJP leadership. In both MP and Chhattisgarh, where foodgrain production had zoomed up in the past decade, the announced MSP was becoming more and more irrelevant as government procurement declined because of cuts in government allocations. This left a large number of farmers facing ruin because of non-remunerative prices, much below Minimum Support Price (MSP), in the open market. This was on top of the fact that the farmers had pinned their hopes on Narendra Modi’s promise to fix MSP at 50% more than the total cost of production, which he never fulfilled. As a result of this betrayal indebtedness grew, as did distress and an increasing number of suicides was one of the direct results. In Rajasthan, too, a similar situation was faced by farmers which led to massive protests for many months. In MP, police opened fire on protesting farmers in Mandsaur in June 2017. Joblessness has been a notable and persistent feature of the Modi regime, and in these three states the ruling BJP faced people’s ire over another betrayal of Modi – the promise of one crore jobs. The state government tried to put forth their own employment targets but miserably failed to meet them. Young people, who had supported Modi in earlier elections, turned against the BJP because of this betrayal. Both MP and Rajasthan also saw implementation of policies that squeezed industrial labour by diluting labour laws, allowing freer hire and fire policies, and difficulty in forming their trade unions. But the industrial workers were hardest hit by some of the lowest wages paid in the whole of the country in these BJP-ruled states. Minimum wages are just Rs.5,749 per month in Rajasthan and Rs.7,125 in MP, compared with the minimum calculated by the Indian Labour Conference formula of Rs.18,000 currently. These low wage rates combined with ever increasing prices of food items and fuel costs led to the immiseration of workers. This, too, was a big factor in the anger against the government – both Modi at the Centre and the respective BJP-led state government. Wages of agricultural labourers also have suffered a decline in the past few years in inflation adjusted terms. In all these states, agricultural labourers form a very large part of the electorate and their disenchantment with BJP was expressed in these elections. The funding cuts imposed by these governments on welfare schemes like the rural jobs guarantee programme, Integrated Child Development Scheme, SC/ST scholarships, healthcare delivery system, schools and even foodgrain procurement increased the distress of people, thus turning them away from the saffron party. The defeat of BJP comes after an election campaign in which Uttar Pradesh Chief Minister Yogi Adityanath was the BJP’s main campaigner, holding more than double the number of rallies than Modi himself. The floundering BJP leadership in these states and the national strategists like Amit Shah perhaps thought that they can retrieve the lost ground by turning up the hate filled campaign that the Yogi carries out so well. They wanted to consolidate the Hindutva ‘advantage’ arrived at by encouraging dozens of incidents of mob lynchings in the name of cow protection and the repeated incidents of communal violence. The Ram Temple issue was also raked up during the campaign with saints and seers mobilised to give a call for building the Temple in Ayodhya. However, the results have delivered a slap in the face of such an incendiary campaign. The people have rejected this strategy, reminding one of the way BJP was shown the door in these very states in 1993, a year after the Babri Masjid demolition in 1992 and the ensuing tide of violence. During Modi’s nearly five years at the helm, the continued neglect and, indeed, humiliation of Dalit and Adivasi communities too has played a rolein the defeat of BJP. It has drastically reduced the number of seats reserved for SC and ST in all three states and vote shares too have gone down in these seats. This is because of the relentless rise in atrocities on Dalits and Adivasis, the connivance in dilution of the Prevention of Atrocities Act (POA), the non-implementation of the Forest Rights Act (FRA), the slashing of fund allocation for Dalits and Adivasis under the special component plans and the refusal to either protect job reservation or extend it to the private sector. In the elections to Lok Sabha, to be held in a few months’ time, what has happened in MP, Chhattisgarh and Rajasthan will happen elsewhere too because there too, the people’s reaction will be the same to the same policies. In sum, it may be said that these elections are the beginning of the end of the Modi rule.